Phosphorus is an essential element for plants. Soil contains inorganic phosphorus compounds of calcium. Iron, aluminlum, and organic forms as phospholipids and nucleic acids. Phosphorus when applied to the soil, gets converted into forms of fixed/stable Phosphorus or insoluble forms of phosphates, plants can utilise only 20-30% of applied Phosphorus. Adsorption of phosphate by insoluble forms of iron, aluminum and silicate minerals. Precipitation of phosphate by soluble forms of iron, aluminum and calcium. PHOSCO is produced in a sterile environment and propagated onto a rich, organic base that is light and free flowing, whilst retaining moisture. The micro-organism remains viable for a period of 12 months wherein, each gram has millions of multipliable organisms. It is possible to solubilize this insoluble/fixed form of phosphate with the help of microbes. Microorganism, especially fungi and bacteria, possess the ability to solubilize insoluble phosphates, by secreting various organic substances, which are produced during their life cycles. These substances lower the ph and convert the insoluble form to a soluble form of phosphate. Some of the compounds/organic acids produce like fumaric, Tartaric and Maelic from chelates with calcium, alumium and iron, resulting in effective solubilization and utilisation, of applied phosphates. The product PHOSCO contains large number of microbes. These microbe have capacity to solubilize insoluble phosphates. PHOSCO is a Biological Nutrient Enhancer designed to hasten the solubilization of bound phosphate/phosphorus. PHOSCO is to be used on all types of Cereals, Pulses, Vegetables, Fruits, Oilseeds, Spices and Plantation crops, especially those crops grown in Low phosphorus soils. Mix 1 kg of Phosco in 500 ml water and stir well with a rod. Add the seeds required for 1.0 acre to the above mixture and mix it thoroughly. Air -dry the inoculated seed in a cool place and sow the seeds without delay. For crops like Tomato, Paddy, Cabbage, Vegetables etc. dip the roots in slurry of 1 kg Phosco mixed with 5 lit. Water for 5-10 minutes before transplanting. Cereals like Maize, Paddy, Wheat, etc. Fruits like Grapes, Citrus, Figs, banana, etc. Cotton, Tobacco, Soybean, Chickpea, Cowpea, etc. Plantation Crops like Coffee, Tea, Rubber, Spices, Nuts, etc. Oilseeds like Sunflower, Linseed, Mustard, etc. 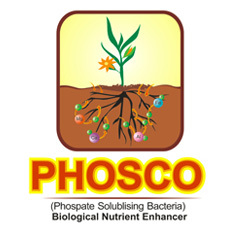 PHOSCO is a living bacteria, thus before or after applying PHOSCO do not apply any chemical fungicide to the plant area. PHOSCO should be stored in a cool, dry, shaded place away from direct sunlight. No Toxic/ Poisonous residues in Food or Soil. PHOSCO ensures better development of root system and enhanced plant growth.